The church of St Michael Cotham is located in an isolated position in a field amongst the earthworks of the shrunken medieval village. At the Domesday survey there was a church and a priest. It has a wonderful mix of windows in different Gothic styles. The tower and the west part of the nave were pulled down in the latter part of the 18th century, and the church has lost its side aisles and probably once had a longer chancel, leaving only a single-celled building with a Victorian south porch; the best of the windows in the once larger church have therefore been reused. The earliest fabric is the south doorway, which is Norman. Careful investigation reveals two 14th century monuments partially hidden in the south wall. The two uppermost corbel stones on the west wall of the nave suggest the position of a gallery, long since vanished. Below these are three carved medieval corbel stone ‘faces’ rescued from the earlier building. 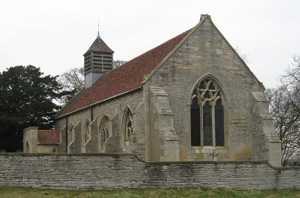 The church was appropriated to Thurgarton Priory in 1350, though had been associated with it from at least 1291. The two principal families linked with the village and the church were the Leekes and Markhams; a fine monument to Anne Markham of 1601 has now been moved to Newark St Mary. The church was largely disused from 1966 and was formally declared redundant in 1986. St Michael’s church is now cared for by the Churches Conservation Trust.